Draft: 2008, New York Yankees, 20th rd. Ambidextrous pitcher uses a six-finger glove with two thumb holes...is a natural right-hander, but has thrown with both arms since age 3...caused Professional Baseball Umpire Corporation (PBUC) to create a new rule regarding ambidextrous pitchers on July 2, 2008, that states "a pitcher must visually indicate to the umpire, batter and runner(s) which way he will begin pitching to the batter"...Is the only switch pitcher in pro baseball, and the only one to do it consistently in more than 100 years...Graduated from Creighton University in 2008 (majored in Marketing)...All American honors from Baseball America and Collegiate Baseball in 2007…Missouri Valley Conference Tournament "Most Outstanding Player" and Collegiate Baseball's national "Player of the Week" after leading Creighton to its first-ever Tournament title in 2007...Selected by New York-AL in 45th round of 2007 MLB First Year Player Draft but did not sign. Appeared in 15 games with Los Angeles-NL, posting a 2.57 ERA (4er, 14.0ip) with a .212 opponents batting average against...Made 45 appearances with triple-A Oklahoma City, going 4-2 with a 1.75 ERA (10er, 51.1ip) and a 0.85 WHIP...Was named a Mid-Season All-Star for Oklahoma City...Was recalled from triple-A to the Dodgers eight separate times...Ended the year with a scoreless streak of 9.2-innings, the longest scoreless streak of his big league career. Spent the season with the Phillies' Triple-A Lehigh Valley, going 9-5 with two saves and posting a 3.36 ERA (26 ER/69.2 IP) in 52 relief appearances…posted a 1.29 WHIP and struck out 69 batters against 36 walks ... Was effective against batters from both sides of the plate, limiting righties to a .216 average and left-handed hitters to a .218 mark…held the opposition to a .217 average with runners on base, while keeping hitters to a .229 mark with runners in scoring position ... Started the season going 7-0 with a 2.23 ERA and one save in 26 games through June 21 ... Prior to the start of the season he was a member of Team Italy in the World Baseball Classic, allowing five runs in 3.1 innings with four strikeouts in three relief appearances. Went 0-0 with a 5.73 ERA (14 ER, 22.0 IP) with 19 strikeouts in 15 combined relief appearances with Toronto and Seattle…went 0-0 with a 6.08 ERA (9 ER, 13.1 IP) with 12 strikeouts in 7 relief appearances with Seattle…made 5 relief appearances with AAA Tacoma, going 1-0 with a 1.08 ERA (1 ER, 8.1 IP) with 11 strikeouts...acquired from Toronto in exchange for a player to be named on Aug. 6...posted 5.19 ERA (5 ER, 8.2 IP) with 7 strikeouts and 4 walks in 8 relief appearances with Toronto…in 25 games, including 2 starts, with AAA Buffalo, was 2-1 with 4.37 ERA (17 ER, 35.0 IP) with 52 strikeouts. Spent the entire season in the Oakland organization, appearing at three different levels, splitting most of the year between Nashville (Triple-A) and OAK. Made his ML debut on June 5 at BOS, tossing 2.0 scoreless innings…Became the first ambidextrous player to play in the Majors since Greg Harris on September 28, 1995. Was placed on the seven-day DL June 12 with a strained right shoulder…Made rehab appearances for Stockton Ports (A) and Nashville before being activated and optioned to the Sounds August 3. While with OAK, posted a 0.51 ERA in games in which he tossed more than 1.0 innings (1ER/17.2IP)…In appearances of 1.0 inning or less he recorded a 10.64 ERA (13ER/11.0IP). 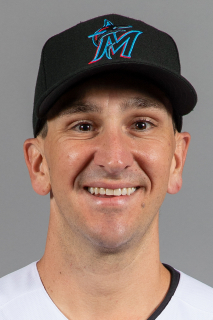 March 15, 2019 San Francisco Giants optioned SHP Pat Venditte to Sacramento River Cats. December 21, 2018 San Francisco Giants signed free agent SHP Pat Venditte. November 30, 2018 SHP Pat Venditte elected free agency. November 28, 2018 Los Angeles Dodgers designated SHP Pat Venditte for assignment. August 21, 2018 Los Angeles Dodgers recalled SHP Pat Venditte from Oklahoma City Dodgers. August 13, 2018 Los Angeles Dodgers optioned SHP Pat Venditte to Oklahoma City Dodgers. August 10, 2018 Los Angeles Dodgers recalled Pat Venditte from Oklahoma City Dodgers. August 9, 2018 Los Angeles Dodgers optioned SHP Pat Venditte to Oklahoma City Dodgers. August 7, 2018 Los Angeles Dodgers recalled Pat Venditte from Oklahoma City Dodgers. July 13, 2018 Los Angeles Dodgers optioned SHP Pat Venditte to Oklahoma City Dodgers. July 7, 2018 Los Angeles Dodgers recalled Pat Venditte from Oklahoma City Dodgers. June 9, 2018 Los Angeles Dodgers optioned SHP Pat Venditte to Oklahoma City Dodgers. June 8, 2018 Los Angeles Dodgers recalled Pat Venditte from Oklahoma City Dodgers. May 31, 2018 Los Angeles Dodgers optioned SHP Pat Venditte to Oklahoma City Dodgers. May 30, 2018 Los Angeles Dodgers recalled Pat Venditte from Oklahoma City Dodgers. May 22, 2018 Los Angeles Dodgers optioned SHP Pat Venditte to Oklahoma City Dodgers. May 20, 2018 Los Angeles Dodgers recalled Pat Venditte from Oklahoma City Dodgers. May 19, 2018 Los Angeles Dodgers optioned SHP Pat Venditte to Oklahoma City Dodgers. May 12, 2018 Los Angeles Dodgers selected the contract of Pat Venditte from Oklahoma City Dodgers. January 30, 2018 SHP Pat Venditte assigned to Oklahoma City Dodgers. November 26, 2017 Los Angeles Dodgers signed free agent SHP Pat Venditte to a minor league contract and invited him to spring training. November 6, 2017 SHP Pat Venditte elected free agency. March 31, 2017 SHP Pat Venditte assigned to Lehigh Valley IronPigs. March 12, 2017 Philadelphia Phillies traded RF Joey Curletta to Seattle Mariners for SHP Pat Venditte. December 1, 2016 Seattle Mariners sent SHP Pat Venditte outright to Tacoma Rainiers. November 23, 2016 Seattle Mariners designated Pat Venditte for assignment. August 27, 2016 Seattle Mariners recalled SHP Pat Venditte from Tacoma Rainiers. August 6, 2016 Toronto Blue Jays traded LHP Pat Venditte to Seattle Mariners for Player To Be Named Later. August 6, 2016 Seattle Mariners optioned LHP Pat Venditte to Tacoma Rainiers. June 13, 2016 Toronto Blue Jays optioned LHP Pat Venditte to Buffalo Bisons. June 7, 2016 Toronto Blue Jays recalled Pat Venditte from Buffalo Bisons. May 25, 2016 Toronto Blue Jays optioned LHP Pat Venditte to Buffalo Bisons. May 17, 2016 Toronto Blue Jays recalled Pat Venditte from Buffalo Bisons. April 27, 2016 Toronto Blue Jays optioned LHP Pat Venditte to Buffalo Bisons. April 13, 2016 Toronto Blue Jays recalled Pat Venditte from Buffalo Bisons. March 30, 2016 Toronto Blue Jays optioned LHP Pat Venditte to Buffalo Bisons. October 24, 2015 Pat Venditte roster status changed by Toronto Blue Jays. October 19, 2015 Toronto Blue Jays claimed LHP Pat Venditte off waivers from Oakland Athletics. August 15, 2015 Oakland Athletics recalled LHP Pat Venditte from Nashville Sounds. August 3, 2015 Oakland Athletics optioned LHP Pat Venditte to Nashville Sounds. July 31, 2015 Oakland Athletics sent LHP Pat Venditte on a rehab assignment to Nashville Sounds. July 23, 2015 Oakland Athletics sent LHP Pat Venditte on a rehab assignment to Stockton Ports. June 12, 2015 Pat Venditte roster status changed by Oakland Athletics. June 5, 2015 Oakland Athletics selected the contract of LHP Pat Venditte from Nashville Sounds. November 19, 2014 Oakland Athletics signed free agent LHP Pat Venditte to a minor league contract and invited him to spring training. November 19, 2014 LHP Pat Venditte assigned to Nashville Sounds. May 17, 2014 LHP Pat Venditte assigned to Scranton/Wilkes-Barre RailRiders from Trenton Thunder. March 13, 2014 LHP Pat Venditte assigned to New York Yankees. January 1, 2014 Caneros de los Mochis placed LHP Pat Venditte on the reserve list. December 8, 2013 LHP Pat Venditte assigned to Caneros de los Mochis. August 13, 2013 LHP Pat Venditte assigned to Trenton Thunder from Tampa Yankees. August 3, 2013 Pat Venditte assigned to Tampa Yankees from Scranton/Wilkes-Barre RailRiders. July 27, 2013 Scranton/Wilkes-Barre RailRiders sent LHP Pat Venditte on a rehab assignment to GCL Yankees2. July 24, 2013 Scranton/Wilkes-Barre RailRiders sent LHP Pat Venditte on a rehab assignment to GCL Yankees1. July 23, 2013 Scranton/Wilkes-Barre RailRiders sent LHP Pat Venditte on a rehab assignment to GCL Yankees2. July 16, 2013 Scranton/Wilkes-Barre RailRiders sent LHP Pat Venditte on a rehab assignment to GCL Yankees1. July 15, 2013 Scranton/Wilkes-Barre RailRiders sent LHP Pat Venditte on a rehab assignment to GCL Yankees2. July 13, 2013 Scranton/Wilkes-Barre RailRiders sent LHP Pat Venditte on a rehab assignment to GCL Yankees1. July 12, 2013 Scranton/Wilkes-Barre RailRiders sent LHP Pat Venditte on a rehab assignment to GCL Yankees2. July 9, 2013 Scranton/Wilkes-Barre RailRiders sent LHP Pat Venditte on a rehab assignment to GCL Yankees1. July 8, 2013 Scranton/Wilkes-Barre RailRiders sent LHP Pat Venditte on a rehab assignment to GCL Yankees2. June 24, 2013 Pat Venditte roster status changed by Scranton/Wilkes-Barre RailRiders. September 20, 2012 Scranton/Wilkes-Barre Yankees activated LHP Pat Venditte from the 7-day disabled list. May 2, 2012 Scranton/Wilkes-Barre Yankees placed LHP Pat Venditte on the 7-day disabled list retroactive to April 30, 2012. April 5, 2012 LHP Pat Venditte assigned to Scranton/Wilkes-Barre Yankees from Trenton Thunder. March 25, 2012 LHP Pat Venditte assigned to New York Yankees. January 21, 2012 LHP Pat Venditte transferred to Leones del Escogido from Aguilas de Mexicali. October 10, 2011 Pat Venditte assigned to Aguilas de Mexicali. March 17, 2011 LHP Pat Venditte assigned to New York Yankees. September 1, 2010 Pat Venditte assigned to Trenton Thunder from Tampa Yankees. March 30, 2010 LHP Pat Venditte assigned to New York Yankees. October 16, 2009 LHP Pat Venditte assigned to Aguilas del Zulia. June 27, 2009 Pat Venditte assigned to Tampa Yankees from Charleston RiverDogs. June 10, 2008 New York Yankees signed SHP Pat Venditte.